The most painful part is all the people that they are causing to fall away from the truth of the gospel of Christ. We ask you to please pray for all the sheep that are being harmed or affected by these movements, there are a lot of sincere and God loving Christians following their wrong teachings. (Our church got involved with some belonging to the NAR movement, we were baby Christians at the time and we embraced them not knowing, latter the Lord opened our eyes). If we get the opportunity to talk to them let us make sure we do it out of love and not because we are trying to win any arguments. Remember we work to glorify God, not ourselves. As the Lord leads please also pray for the leaders and promoters of these ecumenical movement, that the Lord may open their eyes and grant them repentance. Teachers will be judged more severely (James 3:1). -John Arnott, & Carol- (NAR) Pastors of ‘Catch the Fire’ former Toronto Airport Fellowship, (a Vineyard group) of the Toronto Revival– J. Arnott was a speaker on Fire & Fusion Conf. 2014 evangelicals with Catholics. Also see picture above of ecumenical meeting with pope Francis. The Arnotts were part of the group of apostles that commissioned Todd Bentley. See Bentley in their church of Toronto, also Bill Johnson at min 4:31. Here the Arnotts with Benny Hinn. –Heidi Baker in Bethel Church of Bill Johnson. (NAR), (Repeating over and over a word is called Mantra in New Age, a technique used to enter into a “trance” or altered state of consciousness, also used in self-hypnosis). She is a fan of Mother Theresa, her organization ‘Iris Ministries’ (Bethel Pastor Kris Vallotton is the Director, & secretary Stacey Campbell) is the major component of Partners in Harvest, under the leadership of ecumenical apostles John and Carol Arnott”. She also organized the anointing ceremony for Todd Bentley at Lakeland, Florida and had worked with Bentley in Africa. Christianity Today explains that “One night, she had a vision of Jesus in which she literally ate his flesh and drank his blood.” The article further reports “Scholar McClymond describes Heidi as a ‘practical mystic, like Teresa of Avila.’” She and her husband Rolland form part of the Revival Alliance, together with the Arnotts, Bill & Beni Johnson, Randy Clark, etc. all belonging to the NAR. –Be Still DVD. An infomercial of Contemplative Prayer. Presenters include Beth Moore, Max Lucado, Richard Foster, Dallas Willard and many others. –Todd Bentley, (NAR) Lakeland Revival. He teaches Contemplative Prayer. When some discerning pastors began to question his doctrine a group of NAR’s apostles supported & commissioned him on June 2008, 2 weeks later his sin of adultery & drunkenness was exposed by the secular media (ABC’s Nightline). He divorced his wife Shonnah and the revival was over on August 2008. A year later and already married with Jessa, he was restored to work at Rick Joyner’s church and recommended by Rick Joyner, Bill Johnson & Jack Deere (at the time Deere was a bible teacher at Mike Bickle’s Church) all 3 were in charge of the restoration process. His new wife works now with him. See Bentley preaching in Rick Joyner’s Church and being rebuked publicly by some Christian leaders. More here about these revivals. –Mike Bickle (NAR) Bickle founder of IHOP. His “calling” began with a prophet named Augustine Alcala. Then 2 prophets, Paul Cain who worked with Oral Roberts & W. Branham (& who later confessed homosexuality & alcoholism) & Bob Jones (also involved in sexual misconduct) laid down the blue prints of his ministries. Bickle has Catholic speakers at his conferences. He states “Everybody is called to live in the contemplative lifestyle. Everyone! Everyone! Everyone!” & also teaches contemplative prayer. He stated: “I want this book to be the manual for IHOPKC.” referring to a Catholic Mystics book “Fire with In“. Also check here. Truman’s Prayer Center, Mike Bickle is an apostle in the Apostolic Reformation Movement who thinks they are greater than the apostles in Biblical times. Bickle is the executive director of the multiple ministries of IHOP and is the senior pastor of Forerunner Christian Fellowship. “This is not all about “prayer.” The Charisma article explains how prayer is being turned into activism, and this is the activism that is now becoming overly political“. 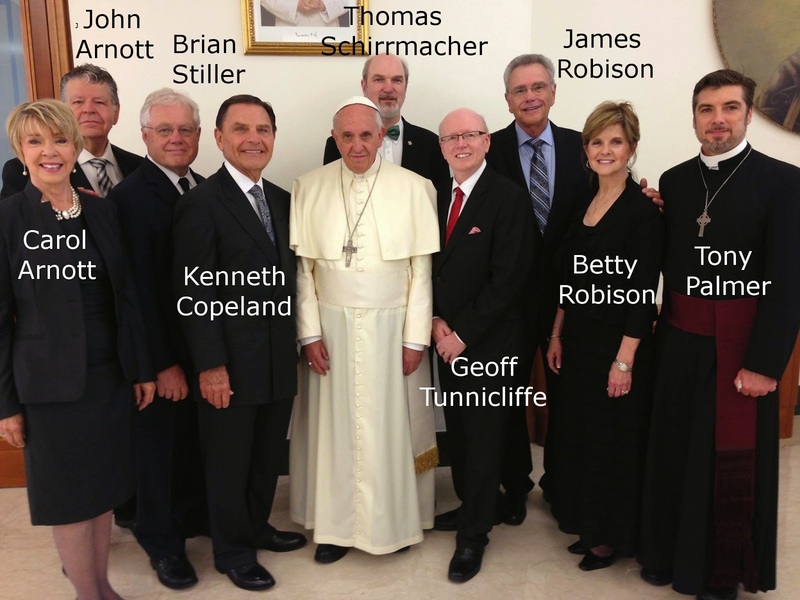 According to Rick Joyner Bickle is also a Knight of Malta. He is part of the agenda of The Order of the Mustard Seed. More here, also check IHOP in pt.2. New: Bickle with pope Francis! –William ‘Jerry’ Boykin, (NAR) LTG (Ret. ), Speaker, promoter of ecumenism. He holds the title of Grand Chancellor of the ecumenical order of knight of Malta. He’s partner in ministry with Rick Joyner & , Freemason Nicholas Papanicolaou, The Prince Grand Master of Knights of Malta. They had the blessings of 2 popes in their Knight of Malta Web site, that later were removed, this is a screen-shot. Boykin’s website admits to being part of Billy Graham‘s ecumenic Lausanne Movement.‘Boykin helped organize the use of abusive treatment of prisoners in Iraq: The Tsunami Headed for the White House. He speaks now at several Calvary Chapels. Video. -Francis Chan, (Neo Calv. ), He seems a very nice person, but nice people can also get deceived, please pray for him. He endorsed New Apostolic teacher Mike Bickle & speaks at his church. He spoke at Rick Warrens’ Saddleback Church and was overflowing with words of praise and admiration for him. He also spoke at Dublin International Eucharist Conference – Dublin, Ireland on July 2012 a Catholic conference. Chan apologized to his church for inviting ex Catholic Mike Gendron, a Reformer like him, who believes Catholics need salvation, Chan cut him off and told the audience it was unloving to insinuate that Catholics are not Christians. Chan practicing Catholic mysticism Lectio Divina with Reformers John Piper, Louie Giglio, Beth Moore & Reformed Rapper Lacrae at ‘Passion 2012’ Conference (See about Lectio Divina ). In his book ‘Crazy Love ‘ he quotes Henri Nouwen who was a Roman Catholic priest, that was into mysticism. He also praises Shane Clairborne author of “Irresistible Revolution”, who worked about 3 months with Mother Teresa in Calcutta, & founded a group of new monks called the Simple Way, a form of new monasticism. –Mahesh Chavda, He is ecumenical and a Knight of Malta, knighted with Rick Joyner and Bob Connor (according to Joyner’s own words, I heard the tape but don’t want to promote it here). He has been working to unite Catholics with protestants. He’s a pastor and mentor of the Anglican and ecumenic Knight Templar ( http://templartimes.smotj.org/) Cannon Andrew White, in the video you’ll see Todd Bentley talking to Chavda’s wife. On some of his meetings fall gold glitter and feathers, same like Bill Johnson and others like them. People have tested the gold dust falling in different places an none of them are gold, like people from Bethel had their particles tested and found they are NOT gold but glitter. You can see this video about Signs and Wonders. –Randy Clark , (NAR) Was a pastor of a Vineyard Church, founded ‘Global Awakening‘. He started the Toronto blessing, but he received the anointing from Rodney Howard Browne. R. Clark was one of the ‘apostles’ that commissioned Todd Bentley. He says:”I believe that the ecumenical movement in the body of Christ is very important to God”, Charisma Magazine. His page mentions: Randy’s ministry crosses denominational lines. From the Westminster Chapel in London, to the St. Thomas the Apostle Roman Catholic Church in Australia. He also promotes Catholic ministries, and his Healing school (teaching material and students) is also ecumenical. -David Crowder, Musician- Contemplative advocate & Catholic Mysticism. Crowder is author of Praise Habit (referring to the habits worn by Catholic nuns): Finding God in Sunsets and Sushi, where he encourages the practice of lectio divina and references and quotes contemplative/emerging figure Walter Brueggemann a number times. -John Crowder & Ben Dunn (NAR), Sons of Thunder they teach mysticism, and their program ‘Jesus trip‘ opens with Catholic Gregorian chant. Pastor Crowder, Mystic communion. Please pray before watching, is dark material video . He also teaches about practicing the presence of God in divine ecstasy, historical examples of levitation, stigmata, nature miracles, invisibility and more. He’s a regular speaker at Bill Johnson’s church. See video ‘Mystic John Crowder exposed‘.